I’m totally failing at the capsule wardrobe for my girls. Pretty much everything clashes with each other! My big girl loves to mix and match the weirdest prints too, so things get very interesting when she dresses herself, which is pretty much everyday. Anyway, I’ve been stash busting (read…lots of clashing prints) and using some of my favorite free patterns. These patterns are great too by some talented designers, and I’m glad to add these items to her back to school wardrobe (it doesn’t get cold until Halloween)! 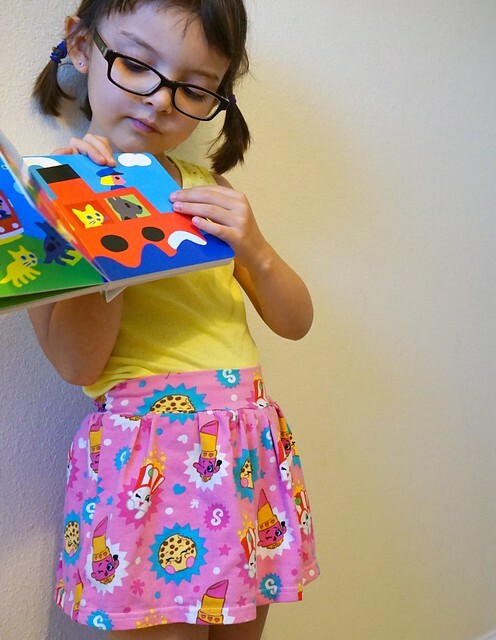 The first pattern is the Monkey Bar Skirt from Hey June (she has more cute free patterns too). This is a serious staple wardrobe item for any girl that likes to run around and play, and us mamas are happy because no one can see their knickers! The cute skirt comes in two versions, one that has a dropped waist, and the one I made, and they both have little shorts underneath. They’re also available in sizes 2-10. I made a size 4, and I ended up taking 2″ off of the waist because she’s a skinny thing. I do think it came out a bit short though, both the skirt and shorts, so I’ll need to make them longer in my next versions. 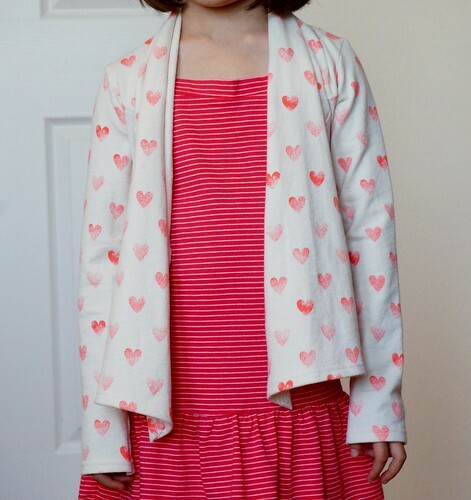 My next wardrobe staple is this cute Scarf Neck Cardigan pattern from Swoon Sewing Patterns. It runs in sizes 3/4 through 9/10. There’s also a ladies version too, and they’re both free. The tutorial is pretty minimal but it is clear. I don’t recommend it for super beginners, but it’s not impossible. I made this in a size 3/4 with a 5/6 length. My girl decided she didn’t want all of the points at the front, so I removed the one from the side panel, blending in the bottom seam lines, but we kept the front panel point. The sleeves are a bit on the long side, but we can easily roll them up so she has some room to grow. I used the same thin french terry knit as I used for these Boxwood Joggers. It’s such a cute fabric for a cardigan, although I don’t think I’d want her to wear them at the same time as the joggers, but with her you never know! A contemporary french terry tracksuit! 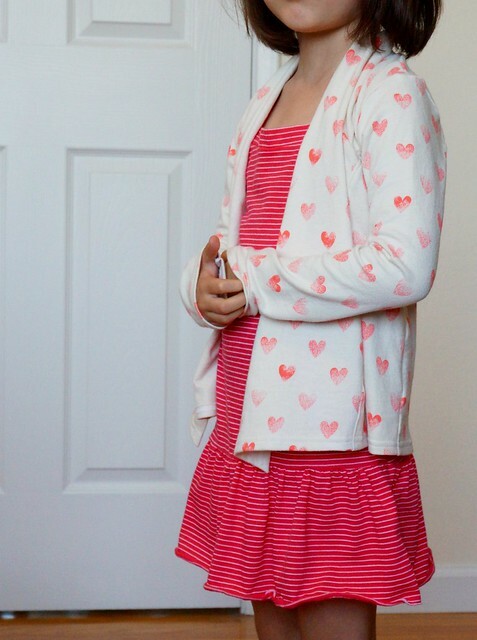 I also have been wanting to try out some basic layering tank top patterns for the girls. Here I made the Cami tank top by Simple Life Pattern Company. It’s such a simple pattern, and if you join Simple Life’s Facebook page, you get it for free, along with a headband. The fabric I used is a thin fashion jersey. 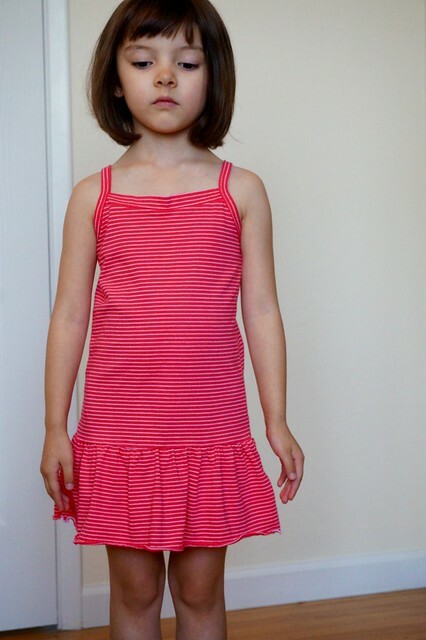 As soon as I finished the top but didn’t hem, she said she wanted it to be a peplum. Luckily I had enough fabric leftover to add on a little 6″ length peplum. She also wanted it just added to the bottom, like a drop waisted dress. My little designer! It turned out super cute, but when she wore it, there was serious neckline gape. You could see all the way to her belly button from the top! Goodness! To figure out how much to remove, I just pinched the excess fabric at the front center neckline, then after removing the straps, cut that amount from the top of the armhole at the sides, and reattached the straps. Much better!